1. 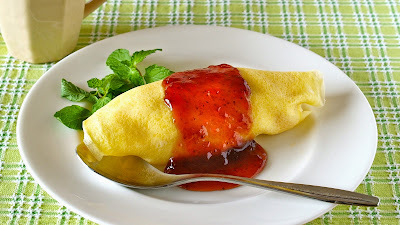 To give a round surface to the omelette, place some whipped cream in the middle of a sheet of crêpe. 2. Place sponge cake cut into an almond shape. Brush the cake with syrup if you like (you can add rum to make it fragrant). 3. Place some whipped cream and fruits of your choice. 4. Then place another sheet of sponge cake and brush the cake with syrup if you like. 5. Fold both both sides of the crêpe, then carefully flip it over onto a plate. 6. Put some strawberry jam on top and garnish with mint leaves if you have.